WILLEMSTAD - On Friday, August 11, the Board members of Curaçao GreenTown Foundation were invited by Prime Minister Eugene Rhuggenaath. 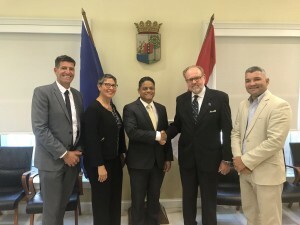 Rhuggenaath earlier announced that he believes that it is good to have an organization such as GreenTown Foundation play an active role in the process of sustainable development in Curaçao and specifically in the area of Schottegat. At the end of the meeting, Minister Rhuggenaath agreed with the board members to discuss internally the possibilities of cooperation with the foundation. In a couple of weeks, they will meet again to give concrete content to this cooperation. Those present during the meeting were the Prime Minister, Policy Officer Gunnar Louisa, GreenTown board members, Ron Pin (chairman), Hrm Rooijakkers (treasurer), Sinuhe Ooman (secretary) and Biana Neman (member). Board members Sven Rusticus and Orland Meulens were not present.